Brewery Vivant Named to Best & Brightest Sustainable List, Announces Major Expansion and Plans for Distribution to Chicago. 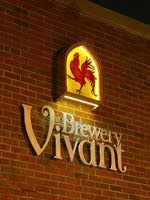 Brewery Vivant, coming fresh off from receiving their honors for Silver LEED certification, has been named to the 101 Best and Brightest list for sustainable companies. Within the same day, the company also announced that they will be expanding their brewing operations to nearly double capacity. The Best and Brightest awards these accolades to sustainable companies that “inspire and produce green technology to impact the industry and environment. This is the premier awards symposium that celebrates those companies that are making their businesses more sustainable, the lives of their employees better, and the community, locally and globally, more responsible as a whole.” Vivant holds their place among other top Michigan companies such as Herman Miller, the JW Marriott Grand Rapids, and Cascade Engineering. “From the day we decided to open Vivant, sustainability has been one of the core values driving our decisions. Receiving this award in our first year confirms that we are on the right path towards making a positive impact on our community and our earth.”, commented Kris Spaulding, owner and sustainability director.